Coastal Style is home-styling inspired by the atmosphere of beach and blue ocean. 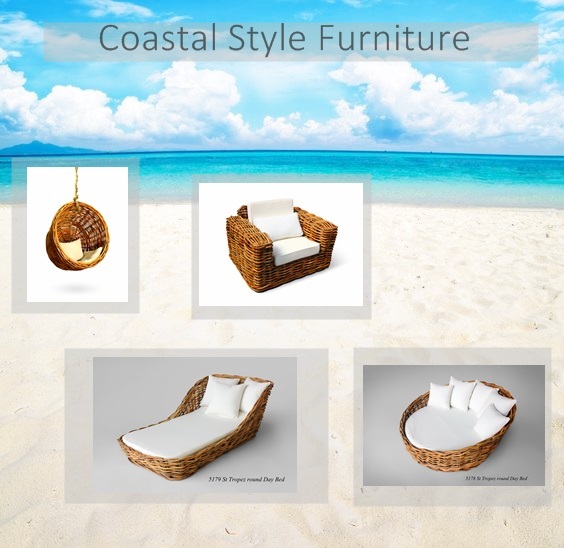 Coastal Style is nowadays popular in Home Décor and Furnishing. Basically, Coastal Style is not only suitable in coastal areas, but also could applied in any area. Especially for hotels and Private Villa on the coastal area, it would be perfect if using Coastal style as decoration and furnishing. Navy blue accents, natural colors like brown soil and gray stone color decor will be the main lead. Natural rattan furniture, rustic wooden furniture and beach color for cushion fabrics are the characteristic for Coastal Style. Natural rattan furniture can be applied for living room and terrace, even in the bedroom. While rustic wooden furniture could make your dining room and your kitchen beautiful. Beach colors such as blue, gray and white will completely beautiful for natural rattan furniture. You can starts decor your Hotel or your Private Villa Coastal Style.